When Americans travel to Europe, it’s tempting to say we’ve “done” Paris, or Amsterdam, or Florence, or wherever we’ve spent a couple days seeing the sites. You jump on the Hop On-Hop Off bus and race to see the Mona Lisa at the Louvre or get your picture taken with a guy in gladiator getup outside the Coliseum. It seems like before you know it, you’re jammed back into your seat on United heading to Newark. The truth is, it’s wonderful skimming the beautiful surface of foreign cities. I am so grateful for what amounts to a glimpse of Prague, a little taste of Venice. I want to return EVERYWHERE, but what is equally compelling is wanting to go someplace NEW. If I ever win the lottery I’ll return to Ghent and Bamburg and Lucca. I also will make my first trips to Lisbon and Barcelona and Mikonos and . . . .
And I will return to Rome. I have been to the Eternal City five times, but you know what? On this last trip with my friend, Fran, I visited places I hadn’t seen before. Since Fran is a “foodie,” she was interested in markets and a cooking class and trying wines, and so on. 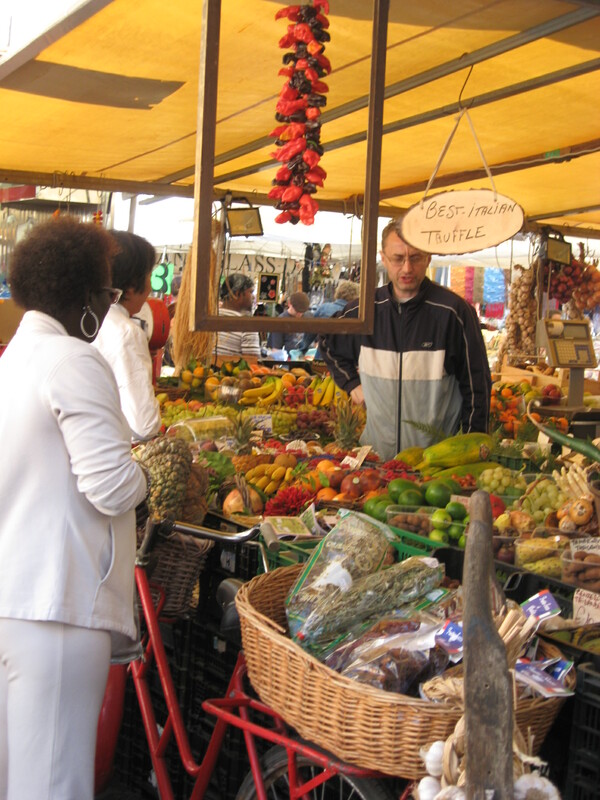 A new spot for me was the morning market at Campo de’ Fiori. I’d heard of the market, but just never found the time (or made it a priority) to check it out on previous visits. That reminds me of a word of advice I got on my first visit to Rome. If you’re at a busy intersection and intimidated by the traffic, look for a nun you can follow. You are guaranteed a safe crossing (thank you, Sister). Back to Campo de’ Fiori. 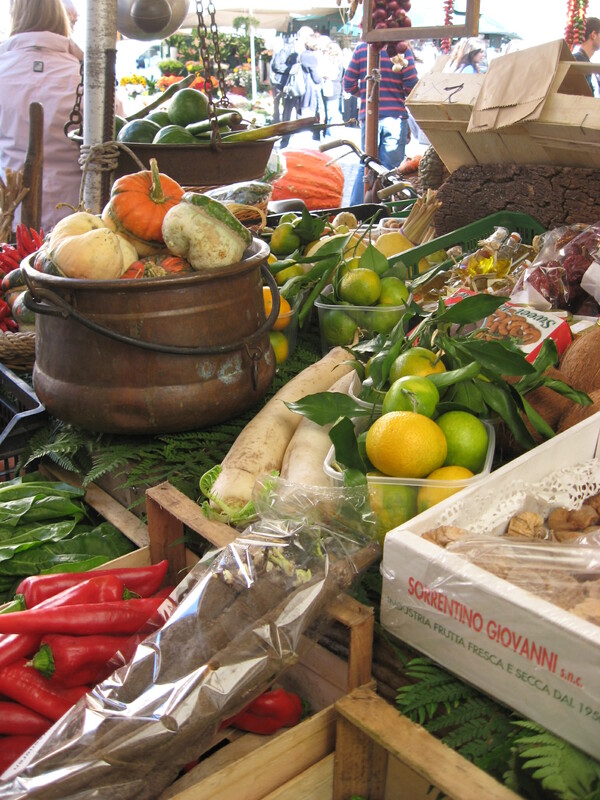 So, you won’t find any bargains, but it is fun to look at all the produce, pastas, scarves and even housewares. There are cafes ringing the market square where you can sip a cappuccino and watch the people, though be forewarned that you will pay a premium for that coffee and snack with a view. At night the area becomes a haunt for young, drunken people (I’m told) and the market itself starts shutting down around noon or so. Happy travels, and more about my cooking class in Rome is coming soon. This entry was posted in Uncategorized and tagged Campo de Fiori, Europe, food, market, nuns, pasta, produce, Rome, travel. Bookmark the permalink. LOVE your view and humorous technique to sites you’re seen! Glad you’re back! I wandered over after visiting diplomaticdog…I clicked in your name… I hope you don’t mind…I have enjoyed reading about your visits…loved your visit to the catacombs & mafia home. How about a visit down under…Adelaide – we have cafes, cathedrals, well maybe 1 or 2, some great markets too..not nearly as interesting as Palermo though – I’m already looking forward to your next trip away. I have three scarves from the market, purchased on two different trips to Roma. I feel the way about Bavaria that you do abut Roma. Also I went with a good friend and saw lots of cathedrals and out of the way places that I would not have seen otherwise. Funniest thing was in our final cathedral. Someone had let loose a pink Bugs Bunnie balloon and it had come to rest on the highly decorated ceiling. It was hilarious and a great end to much cathedral viewing. Jane, my problem is that I love EVERYWHERE. Can’t WAIT to return to Germany. My river cruise began in Trier, cruising from the Mosel to the Main to the Rhine (I might have those out of order! ), finishing in Nuremberg. Have you been to Bamberg? I dream about that town. And Rudesheim. Rothenberg. Cochem, and don’t forget Trier. I adore Europe. Period. Oh, and I got one scarf at the Campo de Fiori market, myself! I have not been to Bamberg but it is on our list for next April’s cruise. We start in Amsterdam and go to Budapest. I have been to Rudesheim (1968) and Rothenberg twice, but will go there again as a side trip again in April. As Joyce told you, we would love to get together with you for any tips you could give for cruise. I really enjoy seeing the photos you have posted on Facebook from your travles.I am sort of busy until mid June, but maybe we could get coffee, or lunch, or wine after that and chat. Miss you at Book Club. Mid-June would be great, Jayne – look forward to meeting with you both! I’ll look for some photos of Bamberg to send you. I fell in love with that town to the extent that If I had no other obligations in my life, I could imagine myself retiring there. The perfect combination of practicality and function for a “real life,” but with a storybook charm and beauty that would make every walk to the green grocer or post office a feast for the eyes.